Glass blowing is one of the oldest and most unique forms of art. Dating back as far as the Roman Empire in the first century BCE, glass art has been marveled by many. Creating glass art has its barriers. There are quite a few glass blowing tools that are required to do the job. We compiled a list of some of the basic glass blowing tools you will need to get started. It is important to note that the tools required depend heavily on what you are creating. While it is possible to create glass art at home, we recommend finding an apprenticeship at a studio like the Duncan McClellan Gallery where you can receive proper training and have access to all of the required tools. Glassblowing is a glass forming technique that involves inflating molten glass into a bubble with the aid of a blowpipe. A person who blows glass is called a glassblower, glassmith, or gaffer. For nearly 2,000 years glassblowing has been closed off from the public. Very few people had the knowledge or tools required to create glass art. Luckily in the 1960s, the American Glass Studio Movement began. 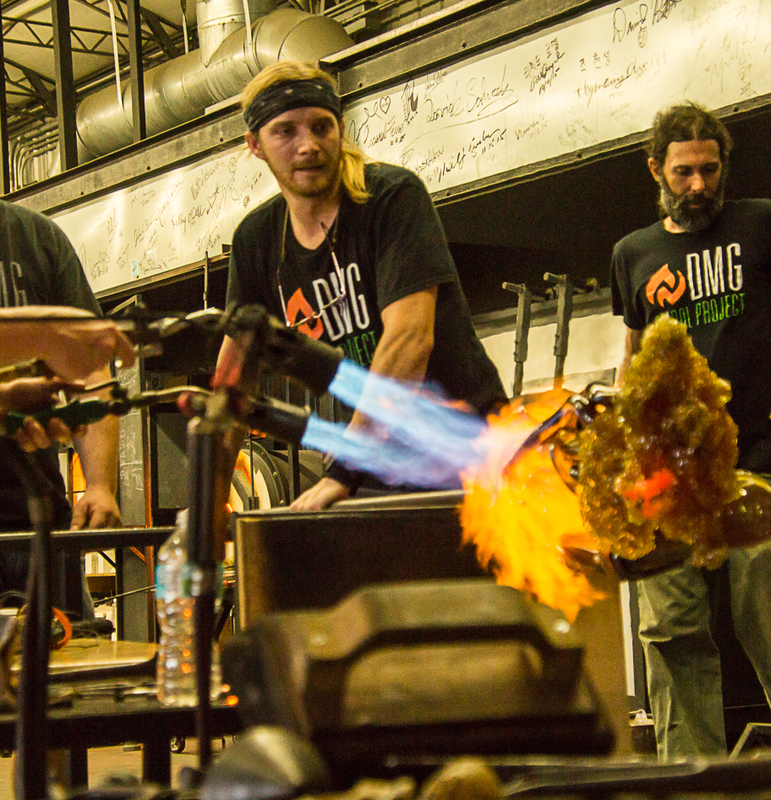 Improvements in furnace technology and a concerted effort to spread knowledge about glass blowing made it more widely available in universities and even some studios that are open to the public. This glass blowing movement can be seen all across the United States, including St. Petersburg Florida where our gallery is located. Hundreds of glass artists and enthusiasts from around the world recently descended on St. Petersburg for the 2019 Glass Art Society conference. This prestigious conference goes to show just how far glass art has come. A furnace plays a vital role in the glass blowing process. Glass must be heated to 1000⁰F in order to be blown. This molten state is why tools are so important. Unlike many forms of art, we can’t use our bare hands. Below are some of the tools you will find in any glass art studio. Block: A block is a wooden tool used to smooth and shape molten glass into a spherical shape. Blocks are soaked in water before use, creating a layer of steam as the molten glass is shaped. This tool is used at the beginning stages of glassmaking before the glass is inflated. Crimp: A crimp is a tool used to add decorative elements to glass by squeezing hot bits of glass between the textured surface. Crimps are available with various patterns and textures depending on your needs. Jacks: A bladed tool used to shape the side walls of the glass. Paddle: A paddle is a wooden board with a handle used for flattening glass, particularly the base or foot of a vessel. Occasionally, a glassmaker’s assistant will protect the glassmaker from excess radiant heat by using the paddle as a shield. Pipe: A long metal tube used for gathering molten glass and blowing air into it. Pontil: The glass piece is attached to this one at the base once it is taken off the first pipe so that the mouth can be shaped. It can also be used to attach additional pieces of glass to the one you’re working on while it’s still on the pipe. Pyrometer: A device used to monitor the temperature of kilns and furnaces. Safety Gear: Protective eyewear, heat resistant gloves, and closed toed shoes are all musts. If there’s anything you think might protect you from injury, it’s a good idea to bring it. With this much heavy equipment and molten glass, it’s always better to be safe than sorry. Shears: The two main types are straight shears and diamond shears. They are used to constrict and cut the glass while it is still soft. Soffietta or Puffer: A soffietta is a metal tube attached to a conical nozzle. After a vessel has been removed from the blowpipe, the cone can be placed into the opening and used to further inflate it. Taglia of “Tag”: A taglia or “tag” is a square-ended knife used to shape or sculpt molten glass. The edge of this steel paddle may be slightly sharp or rounded, providing more shaping surfaces. Tweezers: Just like the ones you keep in your bathroom, except huge. These are used to safely grab the glass and transfer it from the pipe to the pontil.